The Mojave Desert is a large region nearly 50,000 square miles in size that covers large parts of southern California, southern Nevada, and northwest Arizona and southwest Utah. Gold has been mined here since the early Spanish explorers first came to the region, and later discoveries were made in the 1800’s that brought considerable interest. Finding gold is no easy task in this harsh environment. The Mojave gets less than 13” of rain per year on average, with very few perennial streams or rivers. The world famous Death Valley in southern California is part of the Mojave Desert, a place where summer temperatures average well over 110 degrees Fahrenheit. It is important to emphasize this harsh environment before we even discuss locations that you can find gold in the Mojave Desert. This desert is unforgiving, and gold prospecting will take you to some remote and desolate places so it is absolutely critical that you are well-prepared before you venture out. Gold was mined on the Colorado River in the Potholes District, Picacho District, and Cargo Muchacho District. La Paz was the biggest mining town to spring up, with an estimated population of 1,500 at its peak, but the placers quickly played out. While additional small-scale gold mining was likely occurring throughout the Mojave from the late 1700’s through the mid-1850s, the discovery of gold in California’s Mother Lode attracted all the attention away from this region for several years. It wasn’t until the placers of the Mother Lode started to get mined out that prospector’s focused their interest back down toward the Mojave. Earlier prospecting had been on a very small-scale up to this point, but things all changed when several major discoveries were made in southern California and northwest Arizona. By the mid-1800s, several rich gold discoveries were made in the Mojave Desert, and the area was bustling with miners in search of their fortune. In Arizona, the Mojave Desert is within a small part of Mohave County. The county ranked second among the biggest gold-producing counties of Arizona. Reports show that 2,461,000 ounces of lode and placer gold through 1959 worth $40,000,000, the vast majority of which came from lode mines. The bulk or 50% of this production came from the San Francisco or Oatman district. The town of Oatman was the largest settlement in this area for decades. Situated on the western slopes of the southern flank of the Black Mountains, in western Mohave County, the mines of Oatman were considered the richest in all of Arizona for many years. The Union Pass or Katherine district was about 12 miles north-northwest of Oatman and extended from Union Pass, in the Black Mountains, westward to the Colorado River. Its principal route of access is an improved highway, 35 miles long, that connects the Katherine Mill (which became the Gold Standard Mines Corporation in 1933) with Kingman. Two miles east of the Colorado River was the Katherine Mine, which built a 150-ton cyanide mill and produced over $1,000,000 in gold and silver during the Great Depression. The Katherine Mine, discovered in 1900, was on a small knob of granite, about 150 feet across, that rose slightly above the general level of the surrounding gravel-floored plain. There were other several lode mines in Union Pass; notably, Roadside, Arabian, Tyro, Sheeptrail-Boulevard, Frisco, Black Dyke, Pyramid, Golden Cycle Mines and numerous other properties. Gold and silver were first discovered in 1863, but due to trouble with hostile Indians, mining did not begin in earnest until well into the 1870s. The richest mining areas are located in the southwestern part of the Cerbat Mountains. Chloride has a population of only a few hundred people today, but during its peak there were as many as 5,000 people living here. One of the major producers here was the Pay Roll Mine, which occurred in schist and was traceable on the surface for about a mile. The Rainbow vein occurred in granite and gneiss. Several spur veins joined the principal vein and formed ore shoots at the junctions, which were developed by a 260-foot drift. A couple hundred feet farther north was the Windsail vein, which was developed by a 125-foot shaft with about a thousand feet of horizontal workings. Other notable mines at Chloride were the Samoa and Tintic Mines, where most of the ore mined came from shallow depths and within a horizontal distance of about 200 feet. Searchlight is an isolated little desert town in southern Nevada. During its peak there were estimated to be as many as 5000 people living there after the discovery of gold in 1897. While a considerable amount of gold was mined from roughly 50 different mines scattered throughout the hills around Searchlight, nearly all of the gold here is microscopic in size. Cyanide leaching is required to extract the gold from the ores, which is not realistic for the average prospector. There are better places in the Mojave Desert for the small-scale prospector to search for gold, but it is still an interesting old mining town to visit and explore. The Dale district is also known as the Virginia District. The district is located in southern San Bernardino and is about 18 miles east of Twentynine Palms. The district includes the Pinto Basin mining district also. Though gold was discovered here in early 1800s, mining didn’t seriously take foot until around 1890. Mining was also rampant in this area during the Great Depression years in the early 1930s. A number of mines like Gold Crown, Supply, Virginia Dale, and Carlyle mines were very productive during these times. Countless small prospects can be found all around the gulches in the Dale District. Gold has been found here in quartz veins which contain varying amounts of natural gold. There are several high grade pockets for gold in this vicinity which confirms that further exploration could be very worthwhile in this area. Many Southern California prospectors consider the Dale District to be one of the best places to explore if you live in the area. Aside from a few areas such as the Colorado River, most of the Mojave Desert is dry without a drop of water is sight. This makes prospecting for gold much different than in other areas. Gold pans and sluice boxes don’t work very well in the desert. Dry panning is one option for prospectors, but it is very challenging and few people are able to do it effectively. You can bring water with you in your vehicle to use, but this is rather inefficient and heavy to pack around with you. 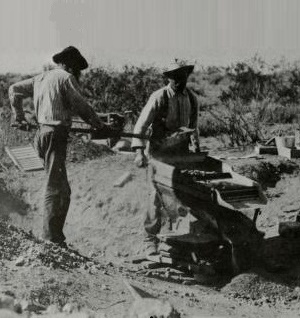 For the most part, gold prospectors in the Mojave Desert use two main tools for the job; metal detectors and drywashers. Metal detecting is particularly popular since several areas within the desert are known to produce sizable gold nuggets. The trick to successfully finding gold nuggets in the desert with a metal detector is to locate the areas where nuggets are known to actually occur. The Dale Mining District and the Black Mountains near Oatman are two places where nuggets can be found. In contrast, you are very unlikely to find any gold nuggets around Searchlight because the gold that occurs here is much to fine to locate with a detector. Gold nuggets can potentially be found anywhere, but they are usually concentrated in the desert washes, where gravity has moved them down from lode sources into the drainages during flash flooding. Drywashing is the other method that works well in desert environment. This mining method has been used since the early days, and if you look carefully while you are in gold country you can often see old drywash tailing piles where the old timers have previously been digging for gold. These are great indicators for areas that you should search today. Using a drywasher is hard, hot and dusty work, but it is the best tool for finding fine placer gold in the Mojave Desert because no water is required to use one. I want to emphasize one more time the importance of safety when prospecting for gold in the Mojave Desert. People die every year from exhaustion and dehydration because they venture into the desert unprepared. Always keep a good survival kit in your vehicle. It is best to avoid the desert entirely during the heat of the day during the summer months. The winter months are the most popular time to explore the Mojave. The Mojave Desert has numerous old mining towns to explore. While most of the large-scale mining has long ago stopped, there is still plenty of gold out there to find. Prospectors can use metal detectors and drywashers to recover gold from the desert washes of the Mojave Desert. There is still lots of gold out there waiting to be found!